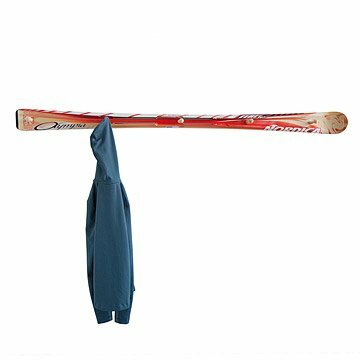 After a long day day on the slopes, hang up your jacket on this sporty coat rack made from a repurposed ski. After a long day on the slopes, kick off your boots and hang up your jacket on this ski coat rack. Handmade by Massachusetts-based artist Michael Bellino, this coat rack is made from repurposed snow skis, retired from their days of plowing through the powder. Whether for your lodge up in the hills or the home you're in when you'd rather be skiing, this coat rack brings the memories of the mountains you've conquered into your foyer. Made in Millbury, MA. Please note, there is no choice of color with this item. What a unique but useful product. This product solves all,our storage needs for the kids towels in the summer and my husband loves it. Would have given 5 stars, but can't figure out hownto hang it. Great product quality. My sister loved it! My borther loves this. It was a Christmas present for him. The only issue is the mounting brackets were a little difficult to use, he told me. And he purchsed heavier duty ones to use since he has heavy winter coats.